REMEMBER: BUM IS A NICKNAME, NOT A DESCRIPTION. 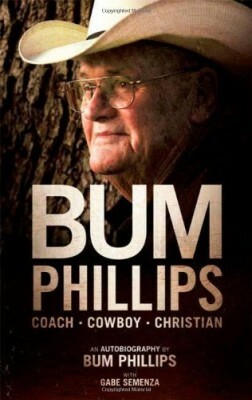 Bum Phillips became head coach of the National Football League’s Houston Oilers in 1975. He retired from the league 10 years later as one of its most colorful characters of all time. While fans of Luv Ya Blue remember Phillips for his cowboy hat and boots, for his down-home Texas yarns, most people don’t know he survived deadly battles during World War II, stumbled almost accidentally into football and later gave his life, during a trip to prison, to Jesus Christ. The book chronicles his transformation from a beer-drinking cowboy, U.S. Marine, and football coach to a devoted son of God. Behind-the-scenes stories from his favorite NFL times. How a small-town man ascended the ranks of high school, college and pro football. Gripping accounts of his time during World War II. His struggle to balance family life with NFL demands. How a trip to prison catapulted this good ol’ boy into a faithful Christian.